Zon-Kuthon's agents in the mortal realm preserve the god's grip on the shadowy nation of Nidal through darkness and horror. The rare few Kuthites gifted with the right to rule are known as the Umbral Court, and Umbral Court agents are their enforcers. Officially, Umbral Court agents operate primarily in the blasted city of Ridwan or the capital of Pangolais. In truth, however, Umbral Court agents operate throughout all of Nidal and its neighboring nations. Some work in the open as diplomats and consuls, others in secret as spies, agitators, and agents provocateur. Most agents in Nidal spend their time hunting down apostates and heretics, seeking to purge the nation of inappropriate influences. Those acting abroad seek out positions in rival nations' halls of power. Regardless of their methods, all serve the greater glory of Nidal—and the will of their dark god—with blind devotion. Umbral Court agents' loyalty to their overlords and ideals does not extend to other agents. Many an agent has fallen to a poisoned dagger from a rival seeking greater power. These minor treacheries are overlooked, or even rewarded, by superiors, so long as they do not interfere with the relative peace and order of Nidal. Agents who thirst for power often make deals with dark entities in order to stay one step ahead of their so-called allies, and in Pangolais it is not uncommon for agents to transform themselves into vampires or other types of undead. To qualify to become an Umbral Court agent, a character must fulfill all of the following criteria. The Umbral Court agent's class skills (and the key ability for each skill) are Bluff (Cha), Intimidate (Cha), Knowledge (nobility) (Int), Knowledge (religion) (Int), Perception (Wis), Sense Motive (Wis), and Stealth (Dex). The following are class features of the Umbral Court agent prestige class. Weapon and Armor Proficiency: An Umbral Court agent gains proficiency with the spiked chain. An Umbral Court agent gains the Darkness domain at 1st level, using his class level as his effective cleric level to determine the effects of its granted powers. If he already possesses the Darkness domain from another class, his Umbral Court agent levels stack with levels in that class when determining the effects of his Darkness domain powers. The Umbral Court agent does not receive bonus spells or domain spell slots from his Umbral Court agent levels. An Umbral Court agent receives Tenebrous Spell as a bonus feat at 1st level, and can apply its effects to his spells without increasing their effective spell level or casting time. In addition, if the spell has the darkness or shadow descriptor or is of the illusion (shadow) subschool, the spell's effective caster level and any associated save DCs are increased by 2 (instead of 1), and any attempts at dispelling the spell in darkness or dim light take a –4 penalty on the dispel check (instead of –2). An Umbral Court agent gains a competence bonus on Bluff, Diplomacy, and Knowledge (nobility) checks equal to his class level. At 2nd level, an Umbral Court agent gains darkvision out to a range of 60 feet. If he already has darkvision, the range increases by 30 feet. At 7th level, the range of the Umbral Court agent's darkvision increases by an additional 30 feet. At 3rd level, an Umbral Court agent can use his touch of darkness ability one additional time per day. When using the touch of darkness ability, the Umbral Court agent manifests shadowy chains that increase the reach of his melee touch attack by 5 feet. A creature struck by these chains must succeed at a Reflex save (DC 10 + the Umbral Court agent's level + the Umbral Court agent's Wisdom modifier) or be entangled for 1d4 rounds in addition to the normal effects of the ability. At 4th level, an Umbral Court agent gains the ability to supernaturally travel between shadows. This ability functions exactly like the shadowdancer ability of the same name. At 5th level, an Umbral Court agent gains a gaze attack similar to the kyton ability of the same name. Creatures within 30 feet of the Umbral Court agent must succeed at a Will save (DC 10 + the Umbral Court agent's level + the Umbral Court agent's Wisdom modifier) or be shaken for 1 round. The Umbral Court agent can use this ability for a number of rounds per day equal to his level; these rounds do not need to be consecutive. Activating this ability is a swift action. The Umbral Court agent is immune to the unnerving gaze of kytons (whether or not his own unnerving gaze is active). This is a mind-affecting fear effect that follows all the normal rules for a gaze attack. As the Umbral Court agent gains levels, his unnerving gaze grows more potent. 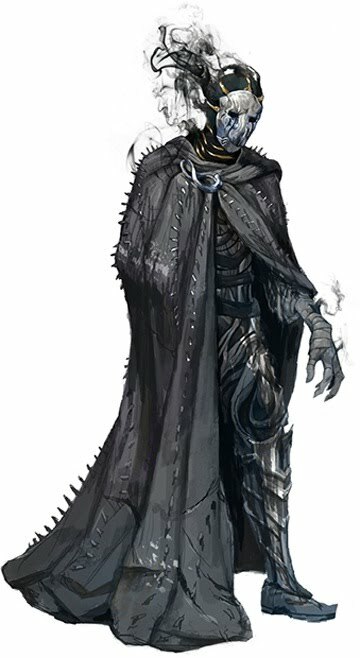 At 6th level, an Umbral Court agent can use his touch of darkness ability an additional time per day, and the reach provided by his shadow chains ability increases by 5 feet (to a total 10 foot increase). In place of entangling the target, the Umbral Court agent can attempt to grapple the target without provoking an attack of opportunity, using his Wisdom modifier in place of his Strength modifier for the purpose of determining his CMB. If both the Umbral Court agent and his target are in an area of dim or darker light, he gains a +5 bonus on this grapple check. The Umbral Court agent does not gain the grappled condition when using his shadow chains this way. He may make combat maneuver checks to maintain the grapple for as long as the effect of his touch of darkness ability persists. At 10th level, an Umbral Court agent can use his touch of darkness ability at will, and the reach provided by his shadow chains increases by another 10 feet (to a total 20 foot increase). When he successfully grapples a creature with his shadow chains, the Umbral Court agent can begin constricting his victim as a free action, dealing 5d6 points of damage whenever he makes a successful grapple check. Creatures constricted in this way are also considered strangled, and cannot speak or cast spells with verbal components.